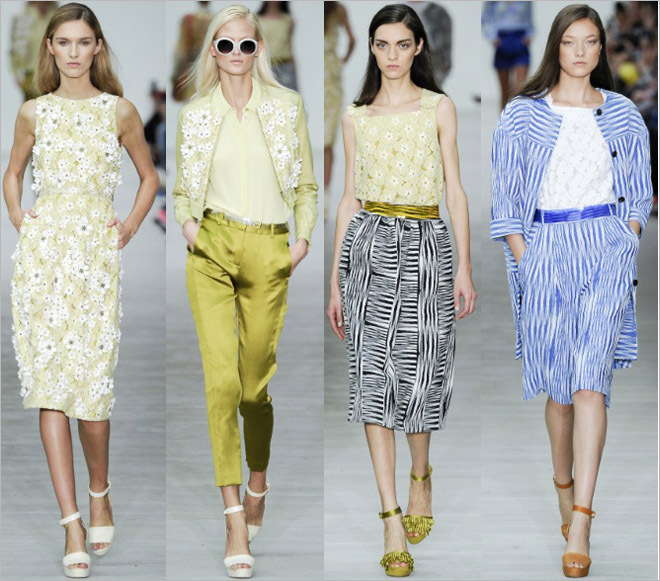 Matthew Williamson's SS 2014 collection attires a career woman, but still playful and radiant. The chosen mediterrenean colours vary from coral, orange, pink, to yellow and to different blue shades, alternated with breezy handwritten floral prints and more abstracted ones, on long flowy chiffon dresses and pencil skirts. For the daytime, Matthew's woman chooses cropped and Capri trousers, trasparent, light blouses and bomber jackets. Rich embroidery on simple almost transaperent shapes for a bohemian chic allure. La collezione Primavera/Estate 2014 di Matthew Willamson veste una donna in carriera, ma pur sempre giocosa e solare. I colori scelti sono quelli mediterranei, dal corallo. arancio, rosa, al lime ed alle varie tonalità di blu, alternati a fresche fantasie floreali, come se fossero dipinte a mano e fantasie più astratte su gonne a tubino al ginocchio e morbidi lunghi abiti in chiffon. 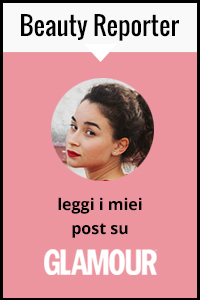 Per il giorno la donna sceglie pantaloni alla caviglia dal taglio maschile, bluse in tessuti leggeri trasparenti e giacche bomber. La sera è un tripudio di ricami preziosi su tessuti semi trasparenti, abiti dai modelli basic dall'allure bohemian chic. Burberry Prorsum's SS 2014 woman chooses pastel shades, alternating them with polka dots and striped prints and precious applications for the night time. Delicate semi-transparent or pierced fabrics, lace and silk on not too tight silhouettes. 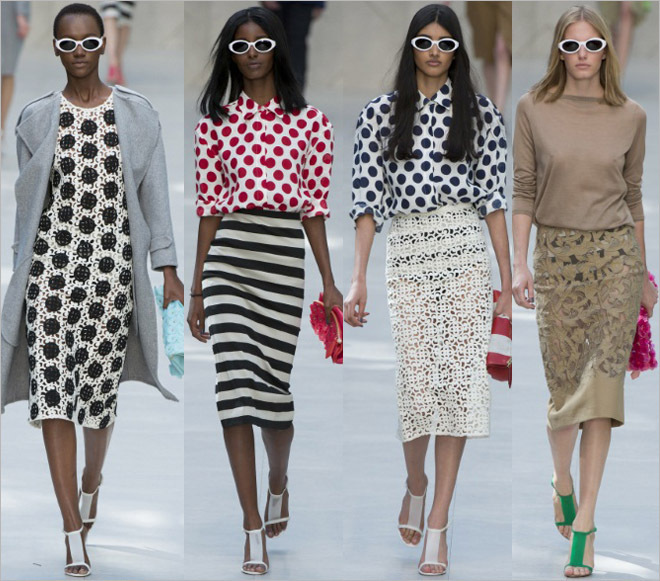 Christopher Bailey's woman favours absolutely knee-lenght dresses and skirts, or slightly below. She's elegant but non too serious; infact she chooses big white sunglasses, fun polka dots shirts and colourful floral clutches. Cashmere and soft outerwears enrich the polished Burberry Prorsum's look, opting for simple coloured heels, in contrast with the colours of the Outfit, creating a likeable joy of colours. La donna Burberry Prorsum Primavera/Estate 2014 sceglie le tonalità pastello, alternandole a stampe a strisce e pois e preziose applicazioni per la sera. Delicati tessuti semi trasparenti e traforati, pizzo e seta su silhouttes fascianti ma non troppo. La donna di Christopher Bailey predilige assolutamente gonne al ginocchio, o leggermente sotto , è elegante ma non troppo seria; sceglie infatti occhialoni bianchi, divertenti camicie abbottonate al collo a pois e colorate clutch floreali. Cashmere e morbide giacche dai colori tenui arricchiscono il raffinato look della donna Burberry Prorsum, che sceglie semplici tacchi colorati in contrasto con i colori della mise, creando un piacevole e spiritoso tripudio di colori. 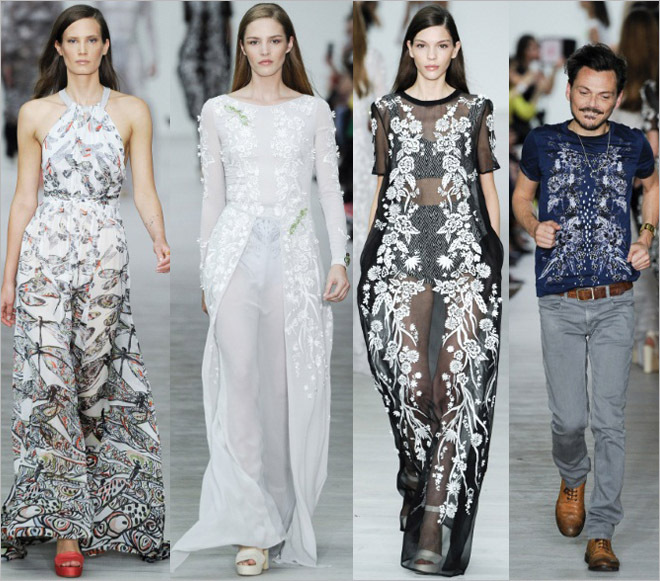 Matthew Williamson is my secret love! and Burberry is awesome as always! 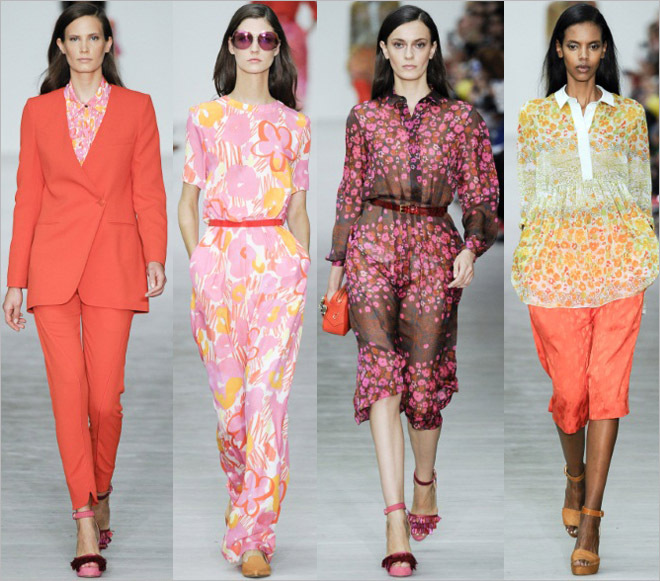 I am absolutely loving both these collections - such great colour, such great prints! Oh my! The collection is soooo pretty. I actually haven't had a chance to look at the new colections yet, but loving this preview! Ah so many pretty things for Spring! Great post! Such wonderful outfits! im loving the sense of muted colours in the outfits!! :D really lovely and chic! I love the new collections. 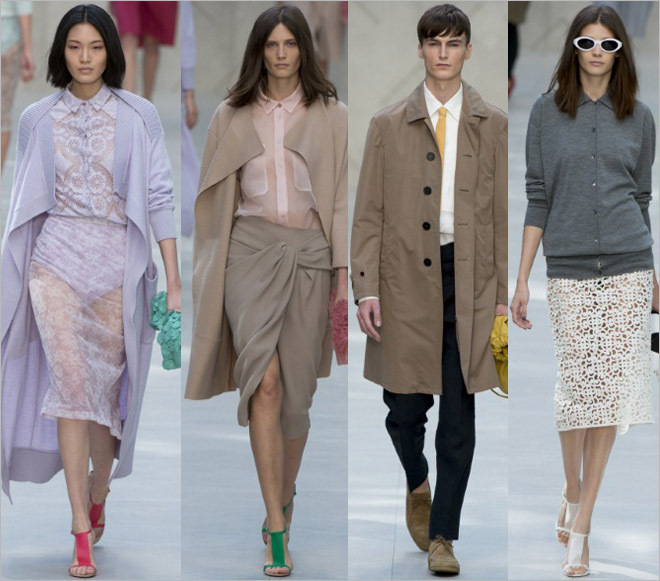 The pastel colours from burberry are so pretty. Great post! I like your blog. Maybe you can visit my blog and follow me on gfc and bloglovin. 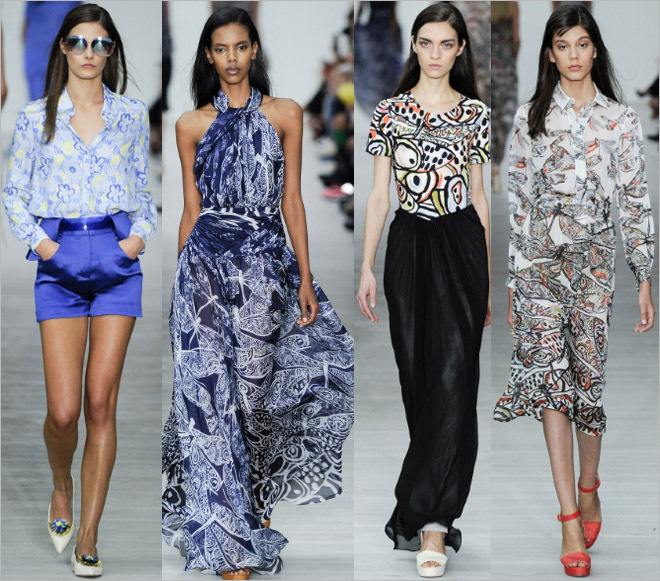 I love Matthew Williamson's designs!! The fabrics and shapes are absolutely feminine! Love everything! So vibrant and fun!